Have you been assaulted at work by a resident? If you are a care home worker and have been assaulted at work by a resident or patient, you may be eligible to pursue a personal injury claim for compensation. Nursing and care home workers can face many challenges in their work. Care workers work tirelessly to make sure that those under their care stay as healthy as possible. They often supervise their patients’ medication and diet, and in many cases help them with their personal care, hygiene, and everyday chores. While caring for an older person may seem like a relatively straightforward task to some, it isn’t necessarily so. One challenge care workers should never have to face is being assaulted at work by a resident or patient, but unfortunately it does happen. It may seem highly improbable that an elderly individual would even be capable of assaulting and injuring someone, more so if that someone is their care worker. For one thing, there’s the often physical frailty that makes it seem highly unlikely. Then there’s the question of why anybody would want to assault a person who is trying to take care of them. The fact is, not all older people are as frail, compliant or responsive as we might assume they are. Some pensioners may be aggressive by nature, while others may lapse into aggressive behaviour because of Alzheimer’s, dementia, or other age-related mental conditions. 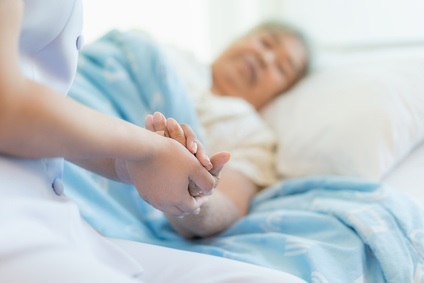 The majority of assaults at work by patients and residents of care homes/nursing homes occur while their care worker is performing a task that involves close contact with them, such as helping them bathe or dress, giving them their medication, or helping them in or out of bed. These assaults typically take the form of verbal abuse, slapping, punching, grabbing, hitting, hair pulling, kicking, or spitting. When a care worker is being assaulted by a resident, they often feel defenceless as they are reluctant or afraid to fight back against their abuser. One reason for this reluctance is the natural instinct not to hit out at an elderly individual. Another more compelling reason is the fear the something may happen to the resident, creating a host of complications for the care worker, and possibly even legal issues. According to the law, all employers have a legal duty of care towards their employees. This is applicable across all industries and all types of workplaces, including care homes and nursing homes. What this means is that those who manage or run a care home must conduct their due diligence to assess the potential risks to their employees. Once this risk assessment is completed, the employer is legally required to put measures in place to ensure that the care home is free from hazards that are likely to cause serious harm to their employees. One of these measures involves protection from being assaulted by a resident. Training is the single most important thing that employers can do to keep their care workers safe at work. Staff, especially those who interact directly with residents, must be taught how to approach aggressive residents, what signs to look for to avoid getting into any dangerous situation, and how to protect themselves when all else fails. Some elderly residents may have a tendency to be physically or verbally abusive. Care homes must have some kind of procedure in place to deal with such individuals, whether it means assigning more than one worker to care for them at any given time or have them placed at a secure psychiatric unit that is better equipped to handle such individuals. This should apply to both residents, patients and care workers. Just because a person is of a certain age, this does not give them a free pass to be abusive to anyone. Care home residents’ families must be made aware of this policy at the time of registering. Most importantly, they need to be made aware of the consequences of failing to adhere to this no-assault policy. If your employer failed in their duty of care and you were assaulted at work by a resident and injured as a result, you must explore your legal options for claiming compensation. You have a right to be safe in the workplace and your employer must ensure that this right is upheld at all times. The first and most important thing to do is to file a formal report of the assault along with photographs of your injuries. This establishes a record of the incident, which your employer cannot deny at a later stage. Also make a note of any other care home staff or residents who were around at the time as you may need them to testify that they witnessed the assault. Once the initial formalities are dispensed with and you’ve received medical attention for your injuries, you should find a personal injury solicitor for advice on making a claim for compensation and to help you put together your case. When you contact a personal injury solicitor, you will generally get a free no-obligation consultation during which the solicitor will want to hear all details of the assault at work and your injuries. If you have a strong claim, the solicitor will advise you to go ahead with your claim and more likely than not offer to take the assault at work claim on by way of a No Win No Fee agreement. A No Win No Fee agreement provides you with a huge advantage as it means you will be having expert legal representation without the worry of needing to pay any upfront legal fees. No Win No Fee solicitors cover all costs associated with the claim from the beginning to the end, although you would of course have to pay a fee when compensation has been awarded. What the cost will be on a successful outcome should be laid out clearly in the No Win No Fee agreement. In our case it would be set as an agreed percentage and would be paid directly from the compensation. If your claim is not successful, you would pay absolutely nothing. If your claim is successful, you can expect to be compensated for the emotional trauma that you experienced, general pain and suffering, all medical and travel expenses associated with your injuries from the assault, and any loss of wages if you had to take leave from work because of your injuries. If you have been assaulted at work by a resident or patient and would like to get the expert advice of a solicitor on making a claim for compensation then please do contact us today to arrange a free consultation.